Giving victims of crime a greater role in the criminal justice system is a relatively recent development, a trend likely to continue and increase in the foreseeable future. In many jurisdictions it has led to compensation schemes funded by the state, support for victims of crime to help them recover from their ordeal, and involvement of victims in decisions as to how offenders should be dealt with. 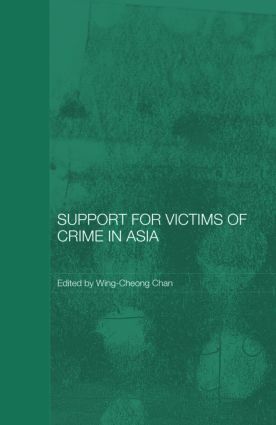 This book examines developments in support for victims of crime in Asia. It shows how, contrary to the widely-held belief that Asian jurisdictions shy away from a rights based approach, there has been considerable progress in support for victims of crime in Asia, especially in Thailand and Korea, where rights for victims of crime are entrenched in constitutional provisions, and in Taiwan and Japan. Support for Victims of Crime in Asia discusses international developments, the degree to which support for victims of crime is an import into Asia from the west, and developments in a range of countries, including Thailand, Korea, Taiwan and Japan, India, China, Singapore, Malaysia, Indonesia, and the Philippines. International standards for victims: What norms? What achievements? What next?